A lot has happened since then, and we thought it was a good time to share our progress in three of the grant’s major program areas. To address the need for affordable farmland to grow food in our state, SCLT brought together partners from throughout the region to form Th e Land Access Working Group. The LAWG’s goal is to open up access to farmland by having personal conversations with landowners about how best to protect their interests and by developing web-based tools for facilitation, all while making farmland accessible and affordable for growing farm businesses. Toward this end, the group has been brokering deals, helping landowners write RFPs for use of their land, facilitating lease arrangements between farmers and landholders, and helping both farmers and landowners take advantage of local, state and federal programs that support agricultural projects going forward. 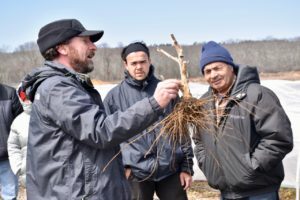 Since 2017, the LAWG has matched four small-scale growers with farmland in Rhode Island. It is currently working with landholders for additional properties, and members anticipate opening up at least 30 acres of land to other beginning farmers over the next few growing seasons. Due to the Beginning Farmer grant, SCLT staff have been able to significantly increase the number of workshops we offer, and to connect more growers with resources and people who can help them expand their farm businesses. Last year we provided 17 beginning farmer workshops attended by 119 growers; this year we plan to offer at least 18. Left: URI Extension’s Andy Radin leading a class in mid-April on the Kingston campus, with SCLT Program Associate Joao Tavares, center, and urban farmer Manny Costa, right. Photo courtesy of URI. One of the partners co-leading these workshops is the University of Rhode Island’s Cooperative Extension program. 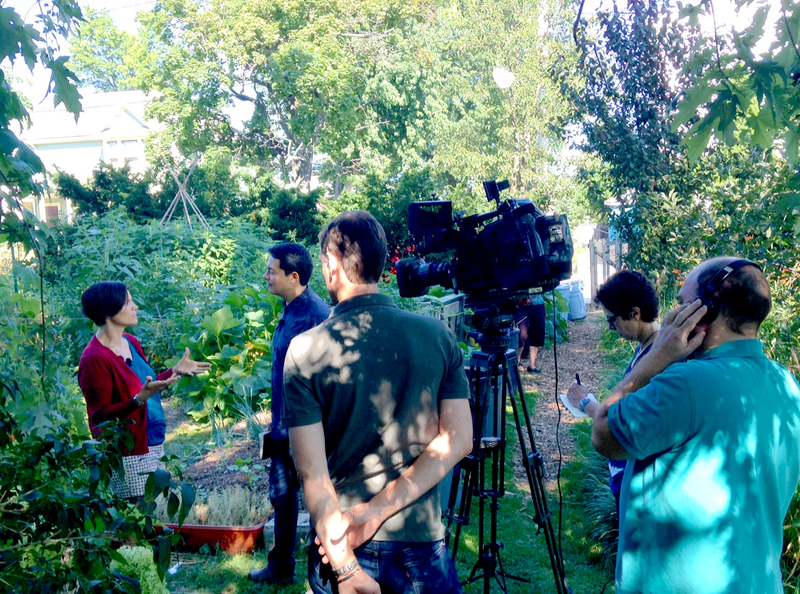 Extension agent Andy Radin, and his colleague, Heather Faubert, have been able to introduce methods and agricultural tools to help urban farmers increase their productivity, and to share ways to prolong the growing season, manage pests and decrease their water use. They’ve also offered farmers free resources including low tunnels and drip tape. Many SCLT workshop participants are from Africa, Asia and Central America and are growing different crops from what Andy and Heather are used to. “People are growing sub-tropical and tropical plants, which makes us rethink horticultural methods that can enhance productivity,” he said. Another farmer training partner is the Northeast Organic Farming Association. Jan Martin, NOFA’s board president, said: “Our workshops are taught by experienced livestock farmers and our partnership with SCLT helps us reach a more racially and financially diverse group of farmers.” SCLT helped sponsor NOFA’s last two winter conferences and is funding workshops focusing on livestock farming during the summer. On-farm apprenticeships are an experiential opportunity to learn directly from farmers through an entire growing season. Most beginning farmers say they are, by far, the best way to learn how to farm. SCLT has hired apprentices at City Farm for several years, and many have gone on to start their own successful farms. But few other farms in the state have the means to pay for comprehensive on-the-job training. The Beginning Farmer Grant has given SCLT three years of funds for three additional farms to hire apprentices. Sidewalk Ends, Foggy Notion and Pat’s Pastured Farm all took on apprentices the past two seasons and are doing so again this year. In addition to providing farm skills, the apprenticeships offer business planning and advanced technical skills training. They also offer apprentices in-depth tours of other sustainable farms in the state to see how different farmers manage their operations. Before receiving the Beginning Farmer Grant, SCLT was making inroads in most of the areas funded. But the grant has greatly expanded our capacity, as well as the number of beginning and working farmers, agricultural partners and property owners we can impact. It has also strengthened farmers and farm networks in the state and accelerated our common goal of helping Rhode Islanders meet a greater share of our food needs in the very near future.